At Blaine Health and Wellness, we pride ourselves on providing Minnesota with the physical therapy they need to recover from a number of health conditions. However, many people are not aware of the impact that physical therapy could have on their lives. Even if they realize the power of physical therapy, if it is the first time they are receiving physical therapy, they may have hesitations because they don’t know what to expect. 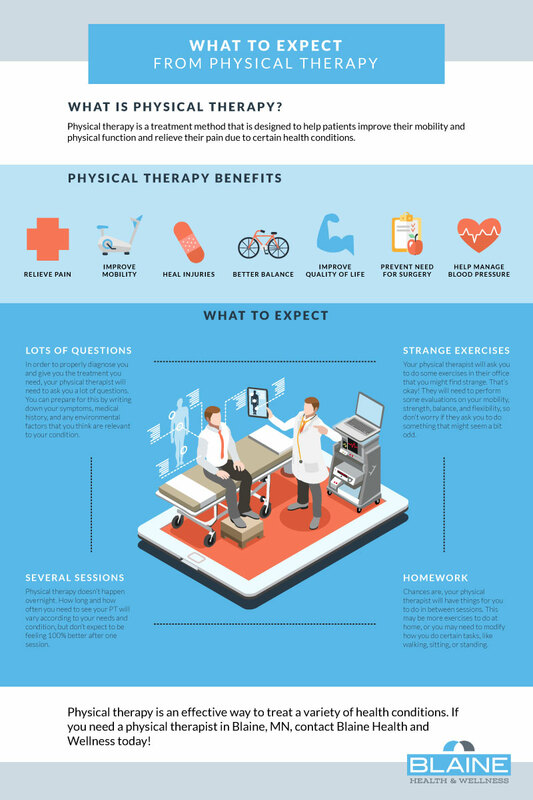 If you are curious about what exactly will go on during physical therapy, read on for some guidance. Before you go to your first physical therapy appointment, you want to be prepared. Start by making a list of questions you have for your physical therapist, like what treatment looks like for your condition and how long it will take. Additionally, write out the symptoms you experience regularly. Consider when these symptoms are worse or better, such as when you are moving, standing, or sitting. If there are certain times of day when your symptoms are worse, note that as well. If there is any strategy you use to relieve your symptoms, also plan on telling your physical therapist about it. Additionally, be prepared to give a complete medical history, from past surgeries to medications to family history to any information you think is relevant to your condition, such as certain environmental factors. At your first physical therapist’s appointment, your PT will begin by asking a lot of questions. The information they gain from this interview will help them determine the best course of treatment for you, so it is important to be honest and open during this process. This is also why it is wise to prepare for your visit by making a thorough list of all relevant information. Your physical therapist may also want to know about your diet, activity level, recreational activities, and home and work environments. After that, your physical therapist will perform a physical examination. What this exactly entails will depend on your particular condition, but may include evaluations of your balance, flexibility, strength, posture, heart rate, and blood pressure. They may examine the mobility of the specific area of concern, as well as how you walk, what you get in and out of a chair, and how you use your body while doing tasks such as bending or lifting. After the examination, your physical therapist will want to talk about your goals for your treatment. Oftentimes, your PT will immediately diagnose your condition and start treatment during your first session. Now that you have gone to your first physical therapy appointment, you have an idea about your course of treatment. It’s important to approach physical therapy as an active participant. It is likely that you will get certain exercises to do at home; make sure that you are following through with them so you can make the most out of your treatment. Additionally, make sure that you implement any other changes that your physical therapist may recommend, which could include modifying the way you do certain activities or changing the layout of your home. Need a PT in Blaine, MN? Contact Blaine Health and Wellness Clinic. We have the skilled physical therapists on staff who you need to help you improve your health and quality of life.